I have never thought of myself as someone who likes satay dishes. In fact, I would go so far as to say I actively dislike most satay dishes. Except, that is, for this one. I'm pleased to have found an exception. This satay tofu stemmed from a desire last weekend for peanut butter tofu. As I was contemplating spreading tofu strips with peanut butter and grilling them, it dawned on me that I was imagining something not dissimilar to satay. A bit of satay research later and I realised that my dislike of satay dishes probably stemmed from my dislike of overpowering coconut milk. So, I made my satay without coconut milk. This sauce has just five ingredients. It is slightly spicy, and very peanut butter-y. It is incredibly delicious. I struggled to actually cook the tofu because I wanted to eat it straight up, raw (and I did eat quite a lot of it straight up, raw). If you do cook it, it is worth the self-restraint required to get there. It's enjoyable on its own, in wraps, in stir fries, and with noodles. The recipe below makes enough sauce for marinating the tofu plus some leftover, so if you do take the noodle route, you could drizzle extra sauce over the top. Whatever you do, I think you'll like the result. But if you somehow don't? Feel free to send me your leftovers...I'll get through them without any trouble. Makes 1 batch, which could serve anywhere between 1 and 4 people depending on how it's used and how restrained you are around this sauce. Satay sauce adapted from this satay recipe on Taste.com.au. 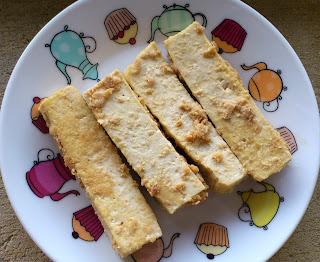 Press your tofu and slice into thin strips. To make the sauce, combine the peanut butter, nut milk, nutritional yeast, kecap manis and harissa and whisk together until thoroughly mixed. Place the tofu strips into a shallow dish and cover with the satay sauce. Marinate for at least an hour before stir frying, grilling or just eating plain. Use leftover sauce atop noodles, stir fried vegetables, or spread on baked sweet potato. 5 Ingredient Mondays June 24th 2013. If you're Australian and haven't already entered, the AntiOx chocolate giveaway featured in this post is open until next Friday 28th June 2013! What do you think of satay? This reminds me of an ultra-lazy peanut sauce I used to make when Andy was away - peanut butter, soy yogurt, miso, hot sauce and brown sugar. It was so easy and so good. Mmm, yes! A yoghurt version sounds great too - I'll have to try that next time instead of the almond milk. I definitely found it to avoid that 'too rich' feeling I associate with most satay sauce versions. I liked Theresa's idea for yoghurt too - that might help in your case also? So this is what I make frequently except I just smoosh up the cold tofu with the ingredients and eat it with a spoon HOLLA. I hope you enjoy it Jan! I don't think I have ever made satay but now I really want to try this... Sadly, my pantry is much smaller these days so I'll have to improvise. I think this would lend itself well to improvising - really, the only crucial components are the tofu and peanut butter! Oh this does sound really nice, and not as heavy as using the coconut cream... I really need to lighten my eating up and get some essential nutrients back into my diet! LOL one of the dishes we had at the Thai restaurant tonight was satay chicken. It was very popular :) I think I'd love yours too! It would be tough doing satay with a peanut allergy in the house! Do you ever get opportunities to enjoy it out without her? Or perhaps you forget about peanut butter dishes when you're so used to avoiding the nut - it must become second nature to steer clear. That's good to hear - I do feel sorry for families where it becomes a banned and feared product (although I understand for some families perhaps it is necessary). Presumably she will have to encounter it as she grows older so I also like the idea of talking to her about it rather than just keeping it out of sight and out of mind. This sounds delicious! Lots of peanut butter is always a good thing! The nutritionist in me just wants to say though- you should always cook soy at least a little before eating it, even if it's just a light steam :) Lots of enzyme inhibitors if you don't! The soy in tofu is cooked - the beans get boiled before grinding and coagulating. So the enzyme inhibitors should be, well, inhibited. 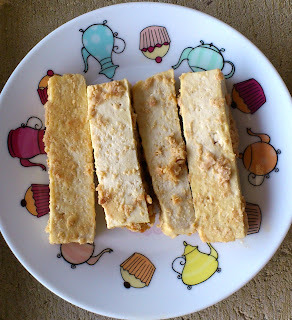 Tempeh is probably different, because the beans are just soaked, not cooked, before culturing. I'm so glad it appeals Colynn - I hope you like it! I go the other way and love the hell out of satay. I use light coconut milk though which may make a difference. The full fat stuff makes me feel a bit sick. Beautiful looking satay sticks! It makes me feel a bit sick too, so I was so glad this one didn't :) I might be joining you in loving the hell out of it now! Oh no! I had a similar experience with kiwi fruit as a child after eating it daily and in large amounts for several months...I still can't eat it now :P We should have an in built protection against such experiences!